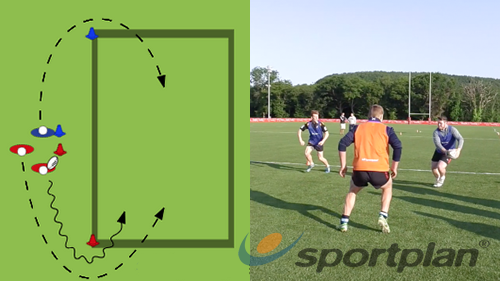 Rugby 2 v 1 Around The Corner Decision making â€¢ The aim of the drill is to develop handling in a short space. 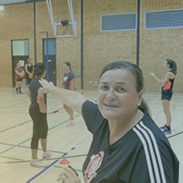 Coach starts with the ball and can throw the ball to either one of the outside players of the 3 players ready to play. One set of cones set wide, another set narrow opposite. Attackers and defender line up at the start of the grid. 2 attackers start with the ball the complete a simple 2v1 catch and pass. Split your players into two teams and line them up behind four cones. How To Rugby - 2v1 Channel Drill. Регбист против двух бойцов без правил !!!!! Focus on skills of 2v1 attack skills both in break out session and within a "Chaos" game featuring both "Off load" and "Touch" in separate channels. Can your players take the bull by the horns and make the right decisions when attacking? Find out in this attacking decision making session! Improve your players' 2v1 confidence and introduce them to the dummy pass, support running and offloading in this attacking session! 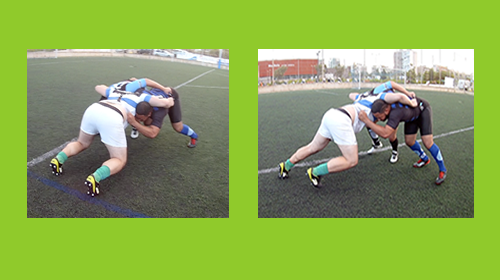 Perform and use possession from a 2v1 scrum? Drills for Level 2! 2v1support and 2v2 go forward/change direction? Does anyone have a really good drill to encourage backs to stay steep? Looking to open a bit of a debate. I was running a? Our under tens when they go into a ruck situation often go straight over the ball leaving it in the open. A is this ball then available to be played by any player from both teams and B if this ball is out how can we teach them to secure the ball. HOW CAN I IMPROVE PLAYERS ABILITY TO PERFORM THE LATERAL?